A 21-year-old college student loves hamburgers – going out to eat hamburgers at least twice a week has made him a 111kg man. Seeking medical help with his diet, unexpectedly, doctors found a severe fatty liver. Through TCM, not only has he lost 10kg, but all liver functions have also returned to normal. Chung Shan Medical University Hospital Department of Integrated Chinese and Western Medicine Dr. Hong-Zhou Zhang gathers over a hundred patient profiles that suffer from hepatitis to collect information about the progress of their TCM treatment, of which, 40 patients have improved their healing process by adding oats to their diet. The 111kg college student is 175cm tall, and during initial diagnosis, his liver function index was 109mg per 100ml (a healthy person should be below 35mg/dl). A thorough abdominal ultrasound scan verified his case of fatty liver disease. Through six months of TCM treatment, the college student has lost 10kg, and his liver function has returned to normal. According to the college student, he craves for food whenever classes end or when he has spare time. Hamburgers and pizzas are his favorite. Yet as time passed by, he gained weight, and his ability to focus has declined; prior to seeking clinical help, he would feel fatigued after a single class. 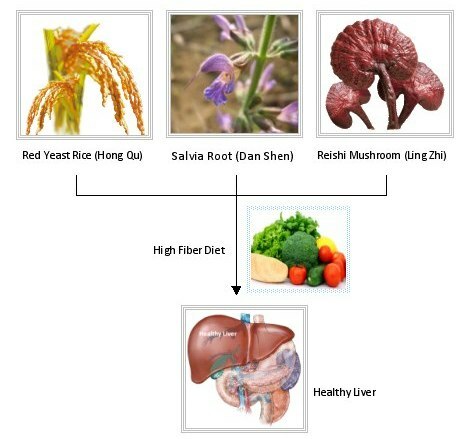 According to TCM Dr. Hong-Chu Zhang, currently, TCM that can both lower blood pressure and have hepatoprotective effects include Salvia Root (Dan Shen), Reishi Mushroom (Ling Zhi), Roselle (Luo Shen Hua), Lotus Leaf (He Ye), and medicinal-grade Red Yeast Rice (Hong Qu). When patients take high-fiber foods such as oats and also exercise, it really helps to improve their metabolism, which in turn reduces their weight, allowing their liver functions to return to normalcy. Dr. Hong-Chu Zhang continues, stating that there are misconceptions that fatty liver disease cannot be treated by medication, or that exercise can cure the illness without medication. However, in severe cases of fatty liver disease, not only is liver functions damaged, but there is also a heighted risk of liver fibrosis and cirrhosis. Leading causes of fatty liver include overindulging in oily, sugary and alcoholic foods; even losing weight too quickly will also cause fatty livers to form. Out of every 100 people, there are roughly 30 with fatty liver, and of those 30, only 3~6 will display symptoms related to liver function abnormalities such as feeling tired, and poor endurance. Dr. Chang would like to remind the public, that when seeking professional TCM treatment, three rules must be met. First, a professional TCM Doctor that correctly diagnoses and prescribes the right medicine for your illness. Second, the medicine used should be GMP verified and its use approved by the local government. Lastly, tracking and checking the effectiveness of the treatment through medical imaging or blood testing is crucial to verifying the safety of TCM usage.